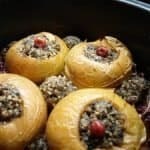 Slow Cooker Haggis Stuffed Apples are a bit of a revelation, the recipe was inspired by a savoury stuffed apple recipe I saw in a magazine. I thought I’d try stuffing the apples with haggis and decided to try baking the apples in the slow cooker before, but they are amazing. The apples hold together really well and, as long as you remember to run a sharp knife around the middle of each apple, to give a little expansion room, or they might explode! Cooking apples stuffed with haggis, slow cooked on a bed of red cabbage with cranberries. Place the shredded red cabbage, cranberries (retain four cranberries for decoration) and sliced onion in the base of the slow cooker with the vinegar, sugar, stock, cinnamon and cloves, season with salt and pepper. Core the apples with a small sharp knife and run the knife around the middle of the apple to pierce the peel. Fill the cavities in the apples with haggis and make the remaining haggis into balls about the size of a walnut. Place the stuffed apples and the haggis balls on top of the cabbage. This is my entry for the December 2015 Slow Cooked Challenge, being hosted this month by Lucy at Baking Queen 74, the theme is Christmas and this red cabbage and cranberry combo is definitely in the festive zone. Full details of how to enter the Slow Cooked Challenge are available on the Slow Cooked Challenge page, we would love you to join us. Thanks Lucy, you could use sausage meat, if you don’t fancy haggis. You can also get veggie haggis which would also do the job. This sound very interesting. Wonder if it would work as well with peppers instead of the apples. Or even tomatoes /marrows. I am not a fan of haggis but I think a savoury mince stuffing would work just as well. Pinned to try! I’m sure you could cook peppers in the slow cooker. Any kind of stuffing would do, turkey stuffing would be brilliant, mince might need some breadcrumbs so it didn’t disappear. Dom also suggested stuffing onions which could work really well. I’ve never tried apples in a slow cooker and I’ve never stuffed them with haggis but this is just a dream combo for me. I’ve tried apples in a chicken brick and that was good so I’d imagine that this is even better. I’ve definitely got to get my sadly neglected slow cooker back into service. I absolutely love that combo of sweet and savoury! 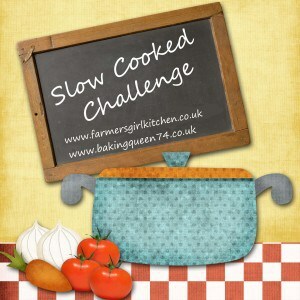 And slow cooker ideas always so welcome!